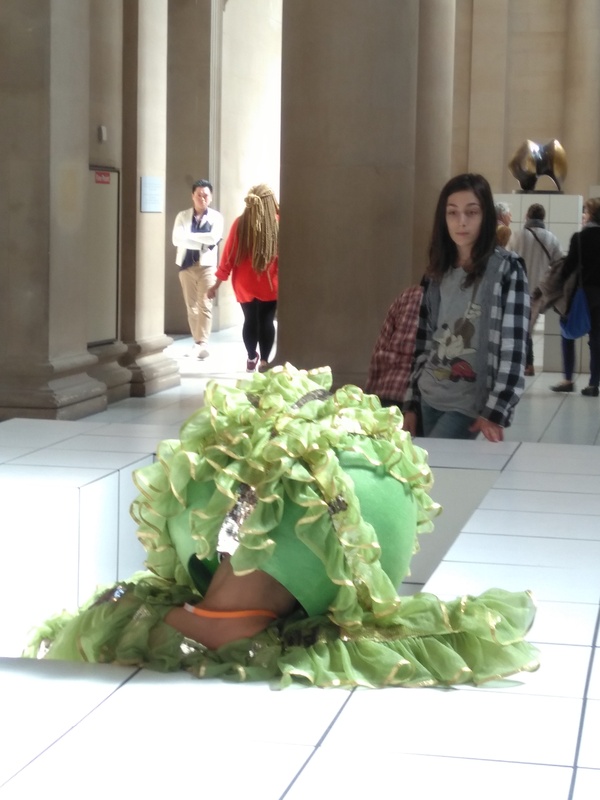 I was recently witness to Anthea Hamilton’s “The Squash” at Tate Britain. The sign at the entry to the Duveen gallery warned me not to sit on or touch the tiled, elevated, “plinths” (holding small sculptures that went unnamed). I was somewhat confused by this as, when doing my research on Hamilton, I watched a video on the Tate website where she claims that her work is very often meant to be touched. What confused me more, though, was use of the performers in her work. The word “performance” (in the wall text) caught my attention followed by the long list of names of performers in this work. I recognized several names of dance artists and professionals in London whose techniques and craftsmanship seemed, on later view, to be encased and locked up in a costume meant to look like a squash. Yes, the vegetable. Each element of The Squash has evolved from Hamilton’s interest in a photograph she found in a book several years ago when looking at improvisational theatre and participatory art practices in the 1960s and 1970s. It showed a person dressed as what looks like a vegetable lying among vines. The original photograph dated from 1960 and depicted a scene from a dance by American choreographer Erick Hawkins. Hawkins was interested in Native American philosophies and he took the form of this costume from the Squash Kachina of the Hopi culture. Whilst I can appreciate an exploration of life as “other” as a way to prompt discussion on “othering” that is so present in our culture today, there seemed to be little information or reference to her motive as a British woman of colour. I hope to learn more yet, given time and for the sake of this post, I will focus below on the role of the performer in Hamilton’s work and address some of my concerns as a dance artist working in and researching dance in museums. My first concern is why there is the impression that the performers are dancing. I see static sitting and positioning of the performers but I would not call that dancing. Moving, maybe, but even that is a stretch. Do vegetables move? Dance? And, my second concern is, the comparison of the dancers to objects and the objectification of the dancer. In some way, on reflection, the bodies of the dancers’ act, as well, like the tiled plinths holding up the work (in this case, costume) of Hamilton. A generous reference would be that of Oskar Schlemmer’s work from the Bauhaus. His interest in dancers moving his costumes around to animate them seems, in this visit to Tate, a far more generous, if not endearing, ask of the dancers. Whilst Hamilton’s feels to be a shallow, if not offensive ask. Why invite trained dancers and performers to literally sit idle? Why not life drawing models? As Pablo Bronstein said of his work, “Historical Dances in an Antique Setting”, (2016) at Tate Duveen galleries, and as discussed in a previous blog post, he works with the pictorial. He, like Hamilton, is a visual artist bringing the dancer into their work. They, however, as makers are engaged in seeing, in the visual aesthetic. There is little to no understanding on the part of the makers of embodied practice and this, therefore, can rob dance of its own kinesthetic, physical being-ness in the work and force it into a rigidity and static-ness that feels deadening. As visual artists make performances we see this void of dance skill and choreographic craft. I admit, seeing the tiled space and colours of the costumes was interesting for the eye. Yet, these works lack an embodiment and an engagement of dance skills and choreographic craft that leaves me both wanting more and somewhat distraught as a dance artist who cares deeply about my craft and the sustainability of my practice and field. So am I. And I am concerned about the future of choreographic craft and dance technique as it gets used by visual artists such as Bronstein and Hamilton. I can respect the interest in looking for ways of gathering, of being together. Yet, art experiences such as this one left me with a feeling of isolation, both for the performer, the other visitors and myself. As we stood around staring at the inanimate dancer encased in a costume there was a feeling of interest turned melancholic. As if the fun, costumed figure had become deflated, exhausted, depressed. Perhaps all of that untapped energy of the dance artist seeps through the holes and gaps of the costume fabric (artwork?) they are holding up and into the gallery space so that we feel that loss, that zapped potential in ourselves, as well. […] live performers who, one or perhaps two at a time, will occupy the space over the next six months, lounging and posing, moving about artistically and looking as decorous and meaningful as anyone can look while wearing a pumpkin on their head. It is this utter lack of recognizing dance as an autonomous artform and suggesting it is in service – and in this case, a near embarrassing one, a commodity – to the artwork that is, in the end, most troubling of all. The fact that art is such a voracious consumer of ‘other’ disciplines and practices is what I find thrilling about it as a space to work in, because it is always pushing itself to a potential of disintegration and always reinventing. Whilst I agree that disintegration can lead to reinvention, I lean more to the idea of integration. I am curious how dance might be integrated into the artwork rather than consumed by it? I agree that the art is a voracious consumer. The acts of borrowing, stealing and re-appropriating are all part of art’s history that allowed innovation at the same time consciously or unconsciously disregarded the histories, techniques and craftsmanship of those forms they consumed. Let’s not let dance be devoured (like a vegetable?) by the visual arts. “The Squash” exhibition/performance opened on March 22 and runs until October 7th.